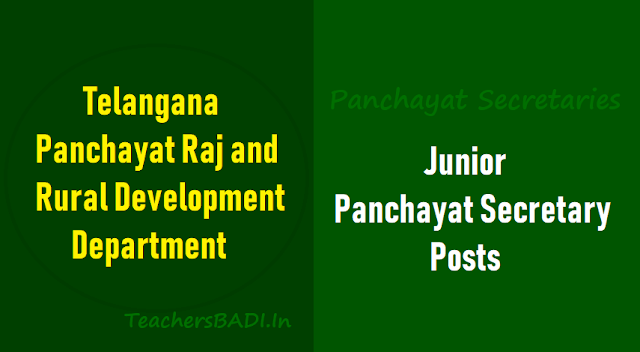 TS Junior Panchayat Secretary posts Recruitment 2018 in Panchayat Raj Department: TS to fill 93553 Junior Panchayat Secretary posts in Panchayat Raj Department: 9355 junior panchayat secretaries have been sanctioned in Telangana Panchayat Raj Department. The Finance Ministry has issued a grant of 9355 posts. The notification for these posts will be announced shortly. Every Grama Panchayat must have a panchayat secretary. The Cabinet Sub Committee has recently convened a meeting chaired by Panchayat Raj Department Minister Juppally Krishna Rao on the steps taken to fill the Panchayat Secretaries posts. Government hereby accord permission to fill (9355) Nine Thousand Three Hundred and Fifty Five vacant posts of Junior Panchayat Secretaries under the control of Commissioner Panchayat Raj 85 Rural Employment through Departmental Selection Committee. జూనియర్ పంచాయతీ కార్యదర్శి దరఖాస్తు గడువును ప్రభుత్వం పొడిగించింది. notification ప్రకారం ఫీజు చెల్లింపుకు చివరి తేదీ: 11-09-2018, దరఖాస్తుకు చివరి తేదీ: 12-09-2018. దరఖాస్తులో ఎదురవుతున్న ఇబ్బందుల దృష్ట్యా ప్రభుత్వం గడువును పొడిగించాలని నిర్ణయం తీసుకున్నది. దరఖాస్తు చేసుకోవడానికి ఈనెల 15 వరకు పొడిగిస్తూ ప్రభుత్వం ఉత్తర్వులు జారీ చేసింది. మంత్రి జూపల్లి కృష్ణారావు సూచనలతో గడువు పొడిగిస్తూ నియామక ప్రక్రియ కమిటీ కన్వీనర్ నీతూ ప్రసాద్ ఉత్తర్వులు జారీ చేశారు. జూనియర్ పంచాయితీరాజ్ పోస్టుల భర్తీ: 9355 జూనియర్ పంచాయితీరాజ్ పోస్టుల భర్తీకి నోటీఫికేషన్ విడుదల చేస్తూ రాష్ట్ర పంచాయితీ రాజ్ శాఖ ఉత్తర్వులు జారీ చేసింది. సెప్టెంబర్ 3వ తేదీ నుంచి సెప్టెంబర్ 15వ తేదీ వరకు పరిక్ష రాసే అభ్యర్థులు ఆన్‌లైన్‌లో ఐప్లె చేయాలని నోటిఫికేషన్‌లో పేర్కొన్నారు. ఫీజు చెల్లింపు చివరి తేదీ సెప్టెంబర్ 14వ తేదీగా అధికారులు పేర్కొన్నారు. పోస్టుల భర్తీ, అర్హత, జిల్లాల వారిగా పోస్టుల వివరాల కోసం http://tspsri.cgg.gov.in. వెబ్ సైట్ సందర్శించాలని సూచించారు. పంచాయతీ కార్యదర్శుల నోటిఫికేషన్: నిరుద్యోగ యువత ఎదురుచూస్తోన్న పంచాయతీ కార్యదర్శుల నియామక ప్రక్రియకు తెలంగాణ రాష్ట్ర ప్రభుత్వం శ్రీకారం చుట్టింది. 9,355 మంది జూనియర్ పంచాయతీ కార్యదర్శుల పోస్టుల భర్తీకి పంచాయతీరాజ్ కమిషనర్ ఆగ‌స్టు 30న‌ నోటిఫికేషన్ విడుద‌ల‌ చేశారు. పంచాయతీ కార్యదర్శుల ఎంపిక కోసం సెప్టెంబ‌రు 3 నుంచి 15 వరకు ఆన్‌లైన్‌లో దరఖాస్తులు స్వీకరిస్తారు. దరఖాస్తు రుసుమును సెప్టెంబ‌రు 14 వరకు చెల్లించవచ్చు. కార్యదర్శుల ఎంపిక కోసం పంచాయతీరాజ్ శాఖ కమిషనర్ అధ్యక్షతన రాష్ట్ర ప్రభుత్వం గతంలోనే ఎంపిక కమిటీని ఏర్పాటు చేసింది. OFFICE OF THE COMMISSIONER OF PANCHAYAT RAJ AND RURAL EMPLOYMENT, PANCHAYAT RAJ BHAVAN, URDU HALL LANE, HIMAYATNAGAR, HYDERABAD. Applications are invited online for the post of Junior Panchayat Secretary from the eligible candidates. Online applications are available on the website: http://tspsri.cgg.gov.in. Last date For payment of fee is 14.09.2018. Total No. of Vacancies are 9355. District wise details of vacancies, eligibility, scheme of examination, fee details, reservations, general conditions etc. are available on http://tspsri.cgg.gov.in. The Telangana government created, sanctioned and accorded to fill 9,355 junior panchayat secretary vacant posts under the Panchayat Raj and Rural Employment department. According to an order released by the Finance department on Friday, the posts were created, sanctioned empower and strengthen the Gram Panchayat administration. The Panchayat Raj and Rural Development department was asked to furnish the direct recruitment vacancies out of the sanctioned posts for issue of orders to the concerned recruiting agency to notify the same for recruitment. The Telangana State government on Thursday accorded permission for the direct recruitment to 9,355 vacant posts of Junior Panchayat Secretaries across the State. Accordingly, the Finance department has issued necessary orders for filling up the vacancies through departmental selection committee under the control of Commissioner, Panchayat Raj and Rural Employment. The Finance department asked the Panchayat Raj and Rural Development Department to take necessary action for filling up vacancies by following rule of reservation, provisions of the Presidential order and services rules. It was also asked to obtain specific orders on the composition of the selection committee, selection process and other issues related to the recruitment process as per the statutory provisions. Instructions were issued to furnish details of the vacant posts including local cadre wise/roster points and qualification etc to the recruiting agency immediately. Public Services - Panchayat Raj and Rural Development Department - Direct Recruitment - Filling of (9355) Nine Thousand Three Hundred and Fifty Five vacant posts of Junior Panchayat Secretaries under the control of Commissioner Panchayat Raj and Rural Employment through Departmental Selection Committee, Hyderabad - Orders - Issued. l. G.O.Ms.No.117, Finance (HRM.I) Dept., dt:10.08.2018. 2. PR85RD Dept., U.O.No.7631/Pts.VI/A2/2018, dt:16.08.2018. Government have reviewed the Direct Recruitment vacancy position in Panchayat Raj 85 Rural Development Department. After careful examination of the proposal furnished by the Department and keeping in view of the actual requirement of manpower with reference to the nature of work and activities of the department and also the overall financial implications, Government hereby accord permission to fill (9355) Nine Thousand Three Hundred and Fifty Five vacant posts of Junior Panchayat Secretaries under the control of Commissioner Panchayat Raj 85 Rural Employment through Departmental Selection Committee. 2. The Panchayat Raj and Rural Development Department, Hyderabad shall take necessary action for filling the vacancies permitted above, duly following the Rule of Reservation, the provisions of the Presidential Order and the provisions of the Service Rules applicable to the relevant posts. They shall adopt a transparent selection procedure for the purpose. The Department shall obtain specific orders on the composition of the Selection Committee, selection process and other issues related to the recruitment process as per the statutory provisions applicable duly following the rules of business. 3. The administrative department and the Head of Department concerned shall furnish details of all vacant posts authorized in this order, including the local cadre wise / roster points and qualifications, etc., to the recruiting agency immediately under intimation to Finance Department. The Department shall issue necessary amendments to their Service Rules and Government Orders in regard to inclusion of the new category, probation period etc., and the existing recruitment procedure / recruiting agency, wherever necessary. 4. The Panchayat Raj 85 Rural Development Department are requested to take necessary further action in the matter accordingly. Panchayat Raj and Rural Development Department – Creation of (6603) Junior Panchayat Secretary posts under the control of Commissioner, Panchayat Raj and Rural Employment, Hyderabad – Orders - Issued. In the circumstances explained by the Panchayat Raj and Rural Development Department in the reference read above and after careful examination of the matter Government hereby accord sanction for creation of (6603) posts in the category of Junior Panchayat Secretary for providing one Panchayat Secretary to each Gram Panchayat to empower and strengthen the Gram Panchayat administration under the control of Commissioner, Panchayat Raj and Rural Employment, Hyderabad. 2. The Panchayat Raj and Rural Development Department may furnish the Direct Recruitment vacancies out of the above sanctioned posts for issue of orders to the concerned recruiting agency so as to notify the same for recruitment. 3. The Panchayat Raj and Rural Development Department, shall take necessary further action in the matter accordingly.